Bushnell 781550 Trophy 15-45x50 Porro Prism Spotting Scope 781550 FREE SHIPPING! The Bushnell Trophy 15-45x50 spotting scope is built to endure, making it perfect for outdoor and tactical use in challenging conditions. Its tough rubber armor protects it against impacts, and the waterproof design makes it suitable for all-weather use. The zoom eyepiece provides magnification up to 50x for long-distance observation, and it comes with its own compact tripod for stable hands-free viewing. The scope's lenses come with multi-layered anti-reflective coatings that maximize light transmission to provide a clear, bright, high-resolution image. The scope comes with hard and soft cases for portability and protection. 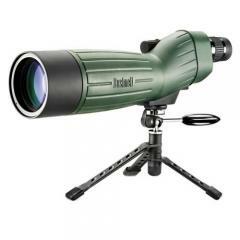 ©2002-2019 CopsPlus.com: Bushnell 781550 Trophy 15-45x50 Porro Prism Spotting Scope 781550 FREE SHIPPING!